When I was pregnant with Lola my mom took me to this little cafe lunch spot in Portland where they made small batches of fresh cookies every morning. They had this oatmeal cookie filled with dried cherries and pistachios. I went crazy for it. I have made a variation of the cookie from time to time, never quite as good as the real thing. But then the other day, as I was eating handfuls of bing cherries, I remembered those cookies. Those cookies and my giant pregnant belly and swollen ankles. But back to the cookies. Now, I actually am not a big fan of dried fruit. I mean its ok. But it has never been a go-to healthy snack for me. And don't even get me started about raisins, gross. 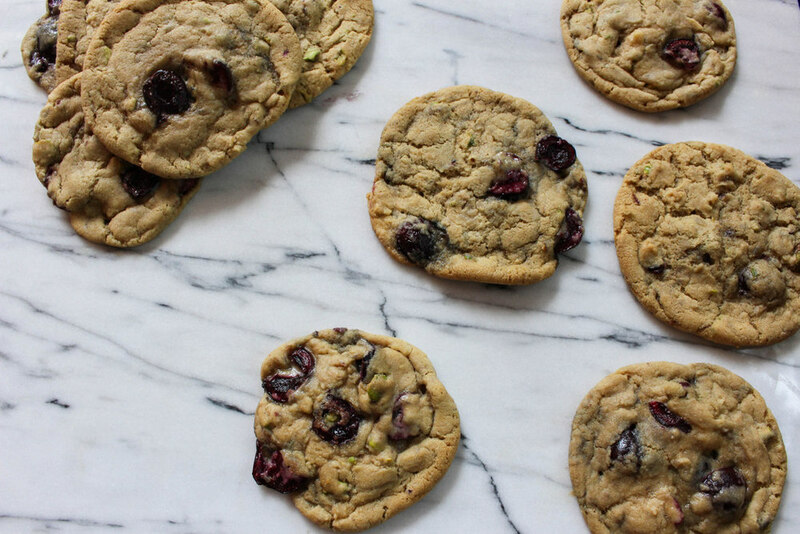 So I thought, what if I make this cookie with fresh cherries instead? Wow, I am so glad that I did. 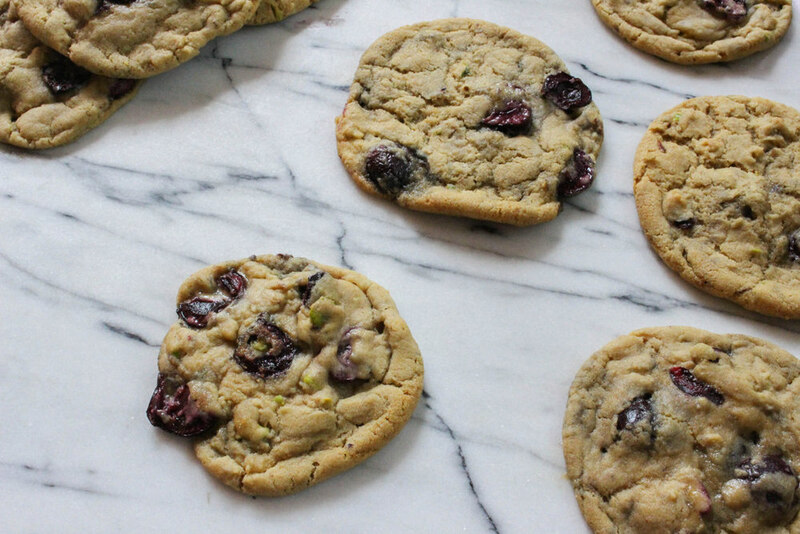 Browned butter cherry pistachio cookies. You ARE my new favorite. Sweet, moist, crisp on the outside, salty and a bit crunchy from the pistachios. This cookie is crazy good. Take 1/2 of the butter (8 tablespoons) and place in a small saucepan. Melt the butter over medium heat, stirring occasionally. First it will foam, and then it will turn amber and begin to form brown nutty smelling bits. Once this happens, remove the butter from the burner and pour it into a small bowl to cool. Using a free standing mixer, beat the remaining 1/2 cup of butter with the brown sugar until the mixture is light and fluffy. Add vanilla extract and molasses and continue to beat. Pour the cooled brown butter into the bowl, with the granulated sugar. Beat for 2 minutes. Add the egg and egg yolk and beat for another minute. Add the flour, salt and baking soda on low speed until just incorporated. Remove the bowl from the mixer, using a spatula, fold the chopped cherries and pistachios into the dough. Remove the dough from the bowl and wrap in parchment paper or plastic wrap. Gently flatten the dough, forming a disk and place in the refrigerator for 30 minutes. Preheat the oven to 350 degrees, placing the racks in the center and upper third of the oven. Scoop the dough using a ice-cream scoop (approximately 2 tablespoons) onto the prepared baking sheets. Leave about 2" between the cookie dough. Bake for 16-18 minutes until golden brown. It is alright if they are a little soft in the middle, they will continue to cook while cooling. Remove from the oven and let rest in the pan for 5 minutes before transferring them to a cooling rack.